Months ago Instagram launched officially the business profiles. At the beginning this function was limited to big and recognized companies. Nevertheless, 3 months ago (July 2016) it was opened to millions of accounts. Through this article I will share everything related to the new Instagram profiles, from how to activate it to how to take advantage of it. Many have asked me the principal differences between these types of profiles and I want to share some examples so you can see the principal differences between personal/normal accounts and business accounts. The button to share on Facebook will publish the contents on your personal Facebook profile or the page you have chosen. The biography of your profile won’t have a contact button. The biography of your profile DOESN’T include the business category. The biography of your profile doesn’t include clickable link, you can only put it inside your bio text. Through your normal profile you cannot access analytics of your account and contents. With a normal profile you cannot promote contents that you already have published on your account. You can only create ads through the ads administrator of Instagram. The button to share on Facebook will publish your contents on the fans page, it will never publish on your personal profile. The biography of your profile will include a contact button. The biography of your profile will include the category of your business (the same you have on your fans page). For example: public figure. The biography on your profile will include a clickable link for your followers. Through your business profile you have access to metrics to measure the effectiveness of your management and contents. With the business profile you can promote the contents with advertising to reach your audience and potentiate your results. These are the principal differences between a profile and the other. As you can see, it is very interesting that you change it if you have a company. In my personal case, it affects me to upload images to my personal profile on Facebook. But the rest, I love it because it helps be measure better my results. 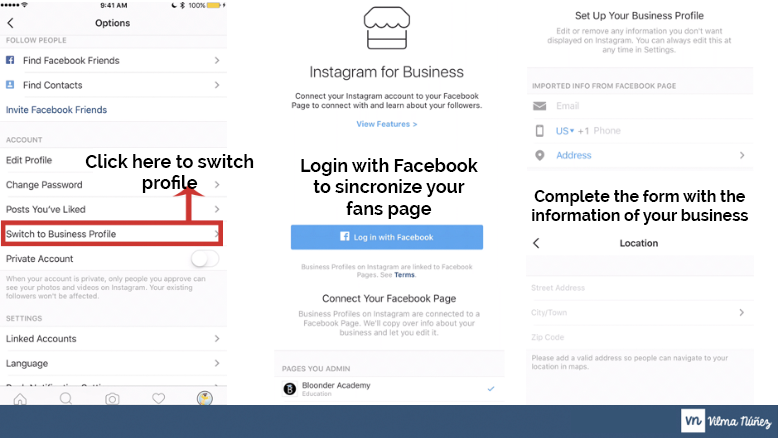 Select the account you want to use to activate the business profile (this is if you have multiple Instagram accounts). Select the option “Switch to Business Profile”. If this option doesn’t appear, you’ll have to update your Instagram application and install in your mobile a VPN application and set United States as your location, this way you can see the settings. NOTE: If you do it this way, it is possible that analytics don’t show when you deactivate VPN. Login with Facebook to connect your Instagram account with a fans page. If you don’t have one, you’ll have to create it. Set the business profile with your email and direction just like it appears on the steps to follow. Another advantage of the business profile is that we can boost our Instagram contents to exactly reach our audience and increase our scope and engagement. To boost your contents you just have to open on the mobile application the content you want to boost and click the button “Promote”. Once you click, Instagram will automatically adapt your image to the squared size and will ask what you want the users to do with your ad: visit your web or call/visit your business. Then you will have to create the audience of your ad, define the budget, and the duration of the ad. When segmenting think about your objective audience, if not you will only be testing without obtaining good results. Your ad will pass to validation and the will start working. If you want to see more metrics and the performance of your ad, you can go to ads administrator or go back to the content you promoted. 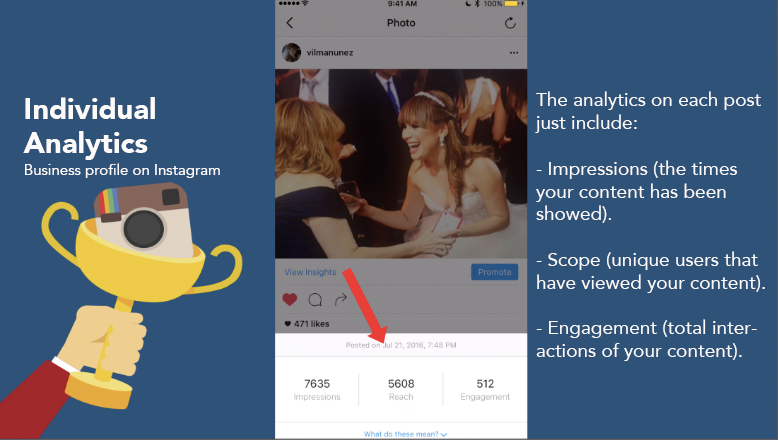 As I commented previously, through Instagram business profiles we can access a section of analytics and have the three most important metrics for each content we share. Since you active your business profile you can see your analytics, you will have to wait 24-28 hours to start seeing the data. If you click on the text “View insights” of your contents, you can access the three metrics. The individual analytics of each content are retroactive. You will only see the ones of uploaded contents after having the business profile. When you see your profile from the application you will see an analytics icon on the right dise. If you click on the icon you can access more interesting metrics of your account that I detail below. I think that the data we can obtain is little, this is why I recommend Metricool and Pirendo to access more interesting data of your account. 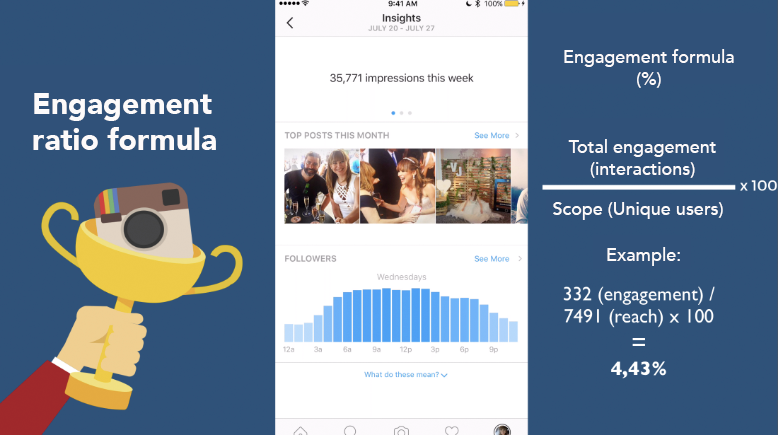 If you want to use these free Instagram metrics to make reports, remember that you will need to take note of the weekly data because they disappear and every week new ones reactivate. Having individual metrics is awesome, but joining metrics strategically to obtain ratios is even better because it helps us improve rapidly. I recommend to figure out the ratio of engagement of each content so you measure which are the most effective. The likes are not the only way to measure it. The most interesting thing is seeing how the users that do see the content react. In occasions, we get frustrated because we have 1000 followers and just 10 likes. Nevertheless, what matters is how many unique users saw it. Maybe only 100 saw it and your 10 likes turn into a 10% of interactions that wouldn’t be of any harm today. Remember that it is almost impossible to get to 70%-100% of your fans/followers without investing in advertising or without content of a lot of quality and relevance. As you can see below, the formula is simple, you take the total of interactions and divide it by the scope, at last you multiply by 100. This way you will have the engagement ratio of your content. My recommendations is that you make an excel as the one I share below. 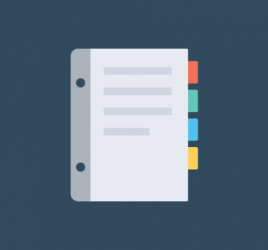 Through this document you will list all your contents of the last month and assigning the scope and engagement of each. As you can see, automatically it generates the ratio of each content and the monthly average. This last metric will be very important for you and will help you improve every month by always obtaining better results. As you could see in this template I add the hour and category of content to see rapidly what works best and take fast decisions. I challenge you to surpass the average each month by improving your contents plan. You can download this template FREE through this link. Activate your business profile so you have access to more content analytics. 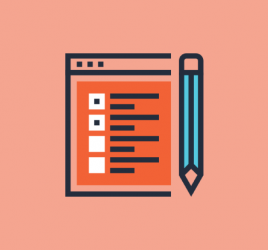 Use the metric of TOP posts to identify the best hour of publication. 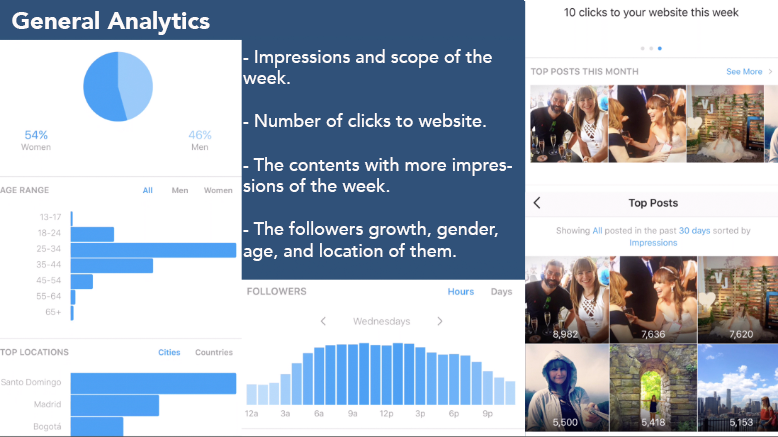 Use demographic metrics to understand the type of audience that follows you and create specific contents for them. Use the metrics of places to make promotions geolocalised. 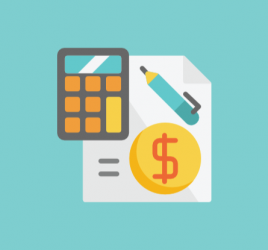 Calculate the average engagement ratio of your publications and optimize the contents to improve every month. Use the metric active followers by day and hours to publish in those hours and multiply your conversions.